The greatest photograph ever taken by mankind? Hello again! I know it has been a while, but life has been spectacularly hectic with geology taking a back seat to my singing exploits. My other blog, A Nightingale Sang... will fill you in on exactly what's been going on if you are interested. Meanwhile, I recently acquired a copy of Professor Brian Cox's excellent book and DVD of his fabulous TV series, 'Wonders of the Universe'. It's absolutely mind boggling stuff, non more so than the following photograph included in the book and taken by the Hubble telescope. I honestly think it ranks as the single greatest photograph taken by mankind. ﻿Okay, so on first glance it may not strike you as all that spectacular - just a photo of the night sky with lots of different coloured stars? Well yes, but take a closer look! Some seem to be more like fuzzy blobs and some almost disc-like in shape. Others seem to be linear features, almost like the trail of a comet. 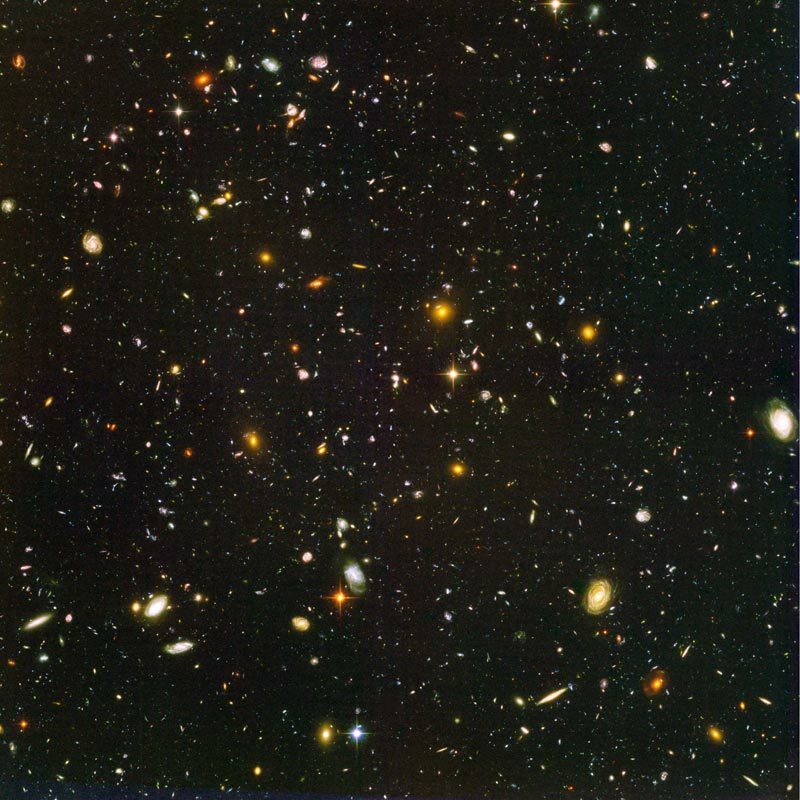 In fact, nearly all the features in this photograph called the Hubble Ultra Deep Field, and taken by the Hubble telescope, are in fact not single stars, but galaxies. 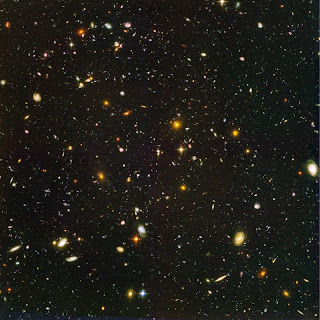 That's around ten thousand galaxies, each made up of hundreds of billions of stars. If that isn't mind-boggling enough, consider this. . . . In 2004 it was decided to focus the Hubble telescope's gaze on a seemingly empty piece of space in the southern constellation of Fornax. A tiny piece of the night sky was chosen and the telescope trained on this location for a period of eleven days, spread over four months. Each of the 800 exposures lasted for around 20 minutes. To all intents and purposes, there was nothing there to see, but over this extended time period ancient, distant light may be received if left for long enough. The dimmest objects within this image are a result of the Hubble telescope receiving just one photon of light per minute. The result is this fascinating image of some of the most distant objects ever observed. The really fascinating thing about this image is that when you look at it you are in effect travelling back in time. The lighter and larger galaxies visible with distinct spiral arms are a lot closer than the smaller redder ones and it is these tiny red ones that are the most intriguing. Astonishingly, it has been calculated that the oldest galaxy seen within this photo is over 13 billion light years away. Therefore, what we are seeing is an image of a galaxy a mere 600 million light years after the Big Bang and the beginning of the Universe itself! Professor Cox's book is crammed with amazing, mind-numbing information and it's a really compelling read. It adds a great deal to the TV series and I would recommend reading it alongside the DVD - not simultaneously unless you want your brain to explode.